I'm super excited about this month's challenge! I have been wanting to make speculaas (cookies) for an eternity, but I keep forgetting to buy a mold. The blend of spices used in these pastries is intoxicating: cinnamon, cloves, mace, ginger, nutmeg, cardamom and a touch of white pepper. Spicy, spicy, spicy! And this recipe doesn't require the mold. Actually, all along I thought "speculaas" described the cookie, but it actually describes the blend of spices used in the cookie, as well as other desserts like this one! 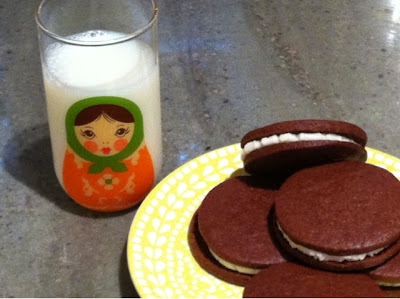 Francijn tells us a little history of the speculaas spices that I'm happy to share with you. Until the 1800s, cloves, mace and nutmeg were exclusively found on the Maluku Islands, in the East Indian Archipelago. That's why these islands are called “The Spice Islands." In order to make a fortune in Europe through the spice trade, a monopoly on European trade was needed. Since the 1500s, the Portuguese had the monopoly on spices. The Republic of the Seven United Netherlands joined forces with Dutch East India around 1600 in order to attempt to take over the monopoly. The Dutch got rich through the trade and flourished, economically, artistically and scientifically, into the 17th century. After these spices became commonly available, baker's guilds began to make secret spice mixtures. One that survived through time is "speculaaskruiden" (speculaas spice). Speculaaskruiden contains at least cinnamon (about half), cloves, mace, and ginger, and sometimes pepper, cardamom, coriander, anise seed or nutmeg. Although the heritage of these times are still noticeable in many Dutch cities to this day, the wealth must be considered in light of the war, violence and oppressive forces used to defend the trade. After World War II, Dutch India became independent from the Netherlands and the spice trade (along with tobacco, opium, sugar and tea) no longer contributed to their economy. I chose to make the spice mixture myself, both because I had the individual spices and because I wanted to be able to adjust the mix to my own preferences. My mixture contains cinnamon, cloves, mace, ginger, cardamom, nutmeg and white pepper. If the raw almonds still have their brown skins, remove them as follows. Bring water to a boil, add the almonds, cook them for one minute, drain immediately and let cool for a few minutes. Rub them between your fingers to remove the skins. Grind the almonds for one or two minutes in a food processor, until you see nothing but very small pieces. (Or skip this step if you use ground almonds.) Add the sugar, and grind for another one or two minutes. It must be very fine after this step. Add the egg and let the food processor combine it - if it is powerful enough. Otherwise you will have to combine it with your fingers. Store the almond paste in an airtight container in the refrigerator. Although the flavor gets better as days pass by, it is not wise to store the paste for too long, as it contains a raw egg. For the same reason you should not eat the paste unbaked. I had leftover frangipane, which is a softer, creamier almond paste, made with the above ingredients, as well as some butter and a touch of flour. I decided to use this instead of the almond paste. To make the dough, combine the flour, baking powder, sugar, salt and spices in a bowl. (I used my food processor.) Cut the butter in dices and add. Knead until smooth. (I pulsed the butter into the mixture and, since I didn't have quite enough, I did add a little milk to moisten the dough.) Wrap in plastic and refrigerate for two hours. Once the dough is chilled, cut it in half and roll each half to fit your pan (either an 8" x 10" pan or a 10" round pan). Whisk one egg as an egg wash. Spray the pan and fit the first half into it, pressing in with your fingers. Smear 1/3 of the egg on top, then spread the almond paste on top. Smear another 1/3 of the egg on top, then cover with the 2nd half of your dough. Smear the final 1/3 of the egg on top and decorate with raw almonds if you'd like. Bake for 40 minutes at 350 degrees F.
Although the dessert turned out beautifully (and delicious too! ), I will say that the modifications I made by using milk (instead of quite enough butter) made the dough very wet, definitely too wet to roll out and form into the pan. I ended up having to heavily flour my rolling space and, once I'd incorporated all of that flour into my dough, I added even more and still the dough was sticking to the board. When I make this again, I'll use the full amount of butter and, if I do have to add some milk for moisture, will be careful to only add a very small quantity. Kat of The Bobwhites was our August 2012 Daring Baker hostess who inspired us to have fun in creating pate a choux shapes, filled with crème patisserie or Chantilly cream. We were encouraged to create swans or any shape we wanted and to go crazy with filling flavors allowing our creativity to go wild! 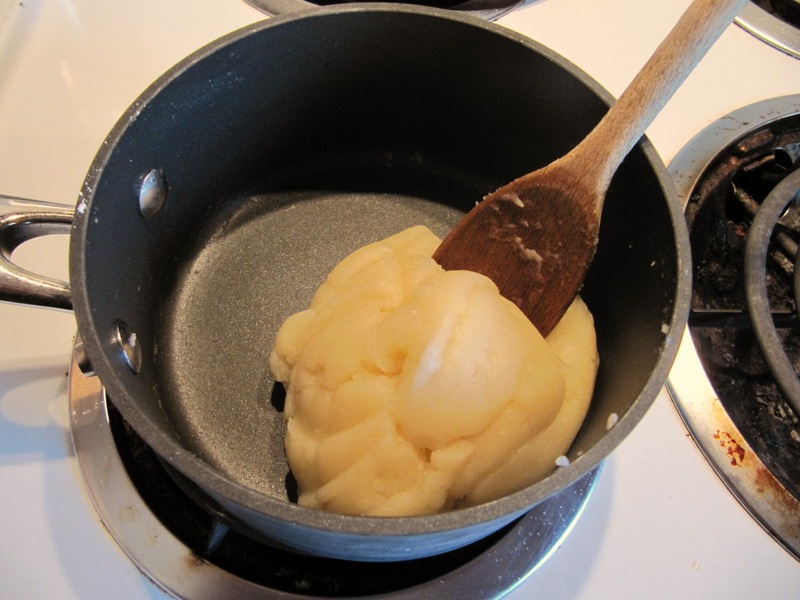 Pate a choux is one of my favorite things to make in the pastry world. The textures of the "in progress" dough/batter is pretty cool. First, when you add the flour to the hot butter/water/salt combo, the mass gets sticky and pulls away from the edges of the bowl. It's neat. But, the really, really, really cool part is when you add the eggs in, they and the batter slide into pieces and slip around each other in the bowl until - - POW - - it comes together. Line two baking sheets with silicone mats or parchment paper, or grease pans well. Preheat oven to 375°F/190°C/gas mark 5. In a small pot, combine butter, water, and salt. Heat until butter melts, then remove from stove. Add flour all at once and beat, beat, beat the mixture until the dough pulls away from the sides of the pot. Add one egg, and beat until well combined. Add remaining eggs individually, beating vigorously after each addition. Resulting mixture should be somewhat glossy, very smooth, and somewhat thick. Using a ¼” (6 mm) tip on a pastry bag, pipe out about 30-36 swan heads. You’re aiming for something between a numeral 2 and a question mark, with a little beak if you’re skilled and/or lucky. Remove the tip from the bag and pipe out 36 swan bodies. These will be about 1.5” (40 mm) long, and about 1” (25 mm) wide. One end should be a bit narrower than the other. Bake the heads and bodies until golden and puffy. The heads will be done a few minutes before the bodies, so keep a close eye on the baking process. Remove the pastries to a cooling rack, and let cool completely before filling. Continue whisking until the cream thickens and comes to a boil. Remove from heat and beat in the butter and vanilla. Pour cream into a bowl. Press plastic wrap firmly against the surface. Chill immediately and until ready to use. Take a swan body and use a very sharp knife to cut off the top half. Cut the removed top down the center to make two wings. Dollop a bit of filling into the body, insert head, and then add wings. Flan is what's called a baked custard, meaning that it's baked to cook instead of stirred. Very basically, a custard is a liquid thickened or set by the coagulation of egg protein. Sounds yummy, huh? 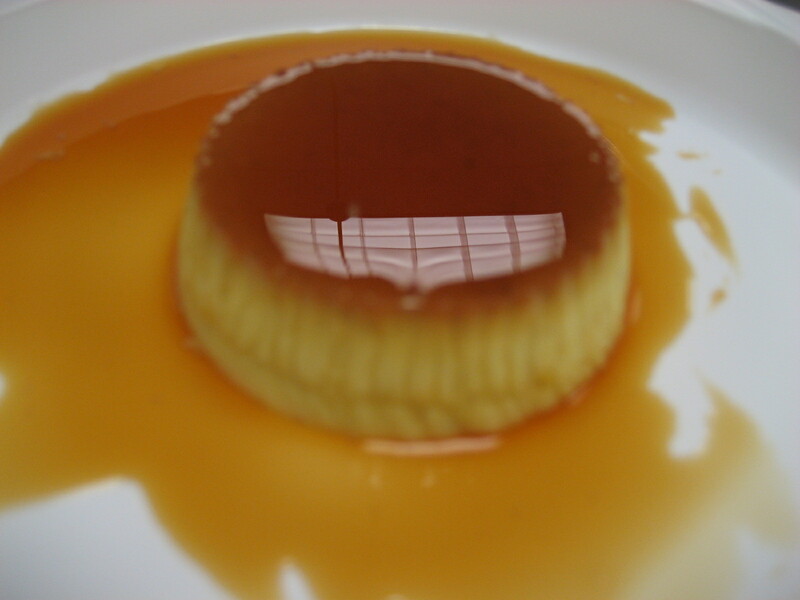 Some other examples of baked custards are creme brulees, pots de creme and creme caramel (which is very similar to flan). The other kind of custard is a stirred custard, which is a custard that is cooked by stirring on the stovetop, like creme anglaise, pastry cream and the liquid that's frozen to make ice cream. A general rule for custards is that they can't be cooked to over 185 degrees internally or they will curdle. The amount and proportion of eggs, yolks/whites to liquid, as well as the type of liquid (cream/milk or combination) determines the consistency of the final product. If a custard is going to be unmolded (like these flan), it needs to have more egg than a baked custard that will be served in the dish in which it is baked. The additional egg provides stability, which is needed when the custard is turned out of the dish. Although the egg whites set the custard, the egg yolks make it creamy and rich. Using whole eggs with yolks makes it the easiest to unmold after chilling. That's it! Eggs, milk, sugar and vanilla! Preheat your oven to 325 degrees and find a rectangular baking pan (that 9x12 you use to make brownies works here) and set aside. To make the hallmark caramel topping for the flan, begin by making a caramel. Take your 1/2 cup sugar, add a few ounces of water, stir and put the pan on the stovetop. Cook until the sugar melts, then thickens, then finally darkens to a light amber caramel. You should use a brush dipped in ice water to clean the sides of your pan of sugar so that the mixture will not crystallize. If you are left with a big hardened mess, your sugar is crystallized and you will need to start again. If the sugar is darkening too quickly for your liking, you can always turn the heat down on your burner. Once the caramel is ready, move quickly and pour a little into the bottom of each of six ramekins, swirling around in the bottom to coat. Do these one at a time, because the caramel will harden shortly after it hits the cool bottom of your ramekin. It shouldn't take more than a few seconds for it to fully harden. Now, prepare your custard. Put the 2 cups milk in a saucepan, heat to scalding. While it's heating up, combine the rest of your ingredients in a bowl, whisk to combine, dissolve sugar. Don't whisk so hard that you fully aerate the mixture. Although you want the sugar to dissolve, you don't want a lot of bubbles. Once the milk is scalded (thin skin on top, not yet boiling), pour it over your egg mixture, whisking constantly. Whisk to combine, then pour through a fine-mesh sieve (metal strainer) into a clean bowl. (Get a quart or so of water on to boil at this point for your water bath.) Pour equal amounts of the custard into your six prepared, caramel-bottomed ramekins. Put all the ramekins into your 9x13 baking pan and carefully move the pan to the oven. Pour the hot water carefully into the side of the pan, making sure not to splash into your flans. You want the water to go at least halfway up the sides of the ramekins. Carefully push the pan into the oven, close the door and bake for about 40-45 minutes. Remove from the oven, cool, then refrigerate. These can definitely sit overnight! To unmold, remove from the fridge, wipe the bottom of the ramekin with a hot washcloth, then invert onto the plate. You may have to wiggle it a little from side to side. The flan should slide from the ramekin and end up caramel side up on the dish, all beautiful-like. Oh, and yummy. Enjoy these, they are a treat!! Here are some other pics of our feast: Pollo Pibil (wrapped in banana leaf), pickled red onions, guacamole, jicama lime salad, Yucatecan barbecued spare ribs and poblano quesadillas. Our friends brought some delicious Mexican-spiced potatoes and fresh-squeezed margaritas! July Daring Baker's Challenge - Crackers! I initially didn't care for this challenge. Once a month, I wanna be surprised by some really difficult challenge and I'm almost always disappointed (initially) when it's not something sweet. But, I'm coming around. After reading the challenge, I realized it would be perfect for July! My family was leaving for our annual beach week on the 21st and, although I'd been asked if I was bringing something, I hadn't committed to bringing sweets. It seems like everyone in the house has been working on their "beach body," so I wasn't sure how rich, sweet desserts would be received. But, I knew everyone would go crazy for some crackers! I decided to make a healthy one and a cheesy one. I loved them both, although the healthy seed crisps were definitely my favorite. I never knew how easy it could be to make crackers and also how rewarding! Plus, the healthy crackers gave me an opportunity to use my pasta roller, which I always love. Hope you too enjoy making some crackers. 1. Mix the flours, seeds, salt and baking powder in a large bowl. 2. Add the oil and stir until combined. 3. Add the water until the dough comes together. 4. Kneed the dough 5 or 6 times and allow to rest, covered, on the counter for 15 minutes. You can also chill the dough at this point and come back later. 5. Preheat the oven to 450°F/230°C/gas mark 8. 6. Working with a quarter of the dough at a time, either use a rolling pin to reach a desired thickness (thick or thin) or roll out in your pasta rollers. If you use pasta rollers, ensure the dough is well-floured so as not to stick. I used a pasta roller and didn't go any thinner than the thickest setting. 7. Place strips of dough on a sheet pan lined with parchment. 8. Bake for 7 minutes, flip them over and bake for 7 minutes more. Then cut or break into crackers shapes while still warm. Return to the oven for a further 5 minutes until crispy. 9. If not crispy enough when cooled, crackers can be returned to the oven. 10. Store in an airtight container and eat within 2 weeks. 1. Combine butter, rosemary and cheese in a stand mixer and beat well. 2. Add the flour, salt and nuts and stir to combine. 3. Form the dough into two tight logs and wrap with plastic wrap. 4. Chill for at least an hour and up to several days. The log can be frozen at this point for several months. 5. Heat the oven to 325°F/160°C/gas mark 3. 6. Slice a log into 5mm (1/5 inch) coins and place on a parchment lined baking sheet. 7. Bake about 10 minutes until golden brown. 8. Store in an airtight container and eat within three days. Cream the softened butter and sugar together in the bowl of a stand mixer on medium until light and fluffy. Add eggs, one at a time, then the vanilla. Sift together (or just whisk) the flour, the cocoa powder, baking powder and salt, then add to the batter and blend on low just until combined. You may need to scrape the bowl to incorporate all ingredients. Divide the dough in half, and put each half between two long pieces of plastic wrap. Use a rolling pin (or heck, a wine bottle works too) to roll out the soft dough between the plastic wrap. Put the rolled dough sheets on a cookie sheet and refrigerate for at least an hour to chill. When ready to bake, preheat your oven to 350. Once the oven is at temp, remove the chilled dough and use a cookie cutter (about 2 inches) to cut round cookies. Move them to a parchment-paper lined sheet pan and bake for about 10-12 minutes. Cool on a wire rack. Sandwich with the filling below. Mandy of What The Fruitcake?! came to our rescue last minute to present us with the Battenberg Cake challenge! She highlighted Mary Berry’s techniques and recipes to allow us to create this unique little cake with ease. This month's challenge is in honor of the celebration of the Jubilee, which marks the 60th anniversary of Queen Elizabeth's taking the throne. The year of 2012 has been filled with tours, celebrations, parties and events to celebrate the anniversary. The Battenberg Cake originated in the United Kingdom in the late 1800s during Queen Victoria's reign. The chefs of the British Royal Family were introduced to the German style of cake making which included the use of bright colors and marzipan. The first Battenberg cake was made in that German style to celebrate the wedding of Queen Victoria's granddaughter, Princess Victoria, to Price Louis of Battenberg. The cake is typically a light sponge, made with the use of almond flour and apricot jam. 1. Make the chocolate plastic by heating the chocolate in a double-boiler. When melted, remove from heat, stir in corn syrup until thickened and pulling from edges of bowl. Move to a plastic bag, seal and remove air, refrigerate for at least 2 hours. 2. Preheat oven to 350°F/180°C/160°C Fan Assisted/Gas Mark 4 and grease an 8” square baking pan. 3. 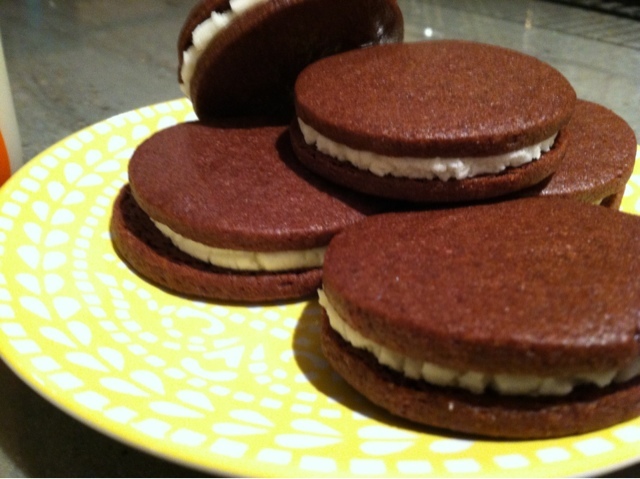 Line the tin with parchment paper, creating a divide in the middle with the parchment (or foil) (see below). 5. Whisk together the dry ingredients then combine with the wet ingredients in a large bowl and beat together just until the ingredients are combined and the batter is smooth. 6. Spoon half the mixture into one side of the prepared baking pan. 7. Add a few drops of red food color to the remaining batter and stir to combine. 8. Spoon the pink batter into the other half of the prepared baking pan. 9. Smooth the surface of the batter with a spatula, making sure batter is in each corner. 10. Bake for 25-30 minutes until the cake is well risen, springs back when lightly touched and a toothpick comes out clean (it should shrink away from the sides of the pan). 11. Leave to cool in the tin for a few minutes before turning out to cool thoroughly on a wire rack. 12. Once completely cool, trim the edges of the cake with a long serrated knife. 13. Cut each colored sponge in half lengthways so that you are left with four long strips of sponge. 14. Neaten the strips and trim as necessary so that your checkered pattern is as neat and even as possible. 15. Gently heat the apricot jam and pass through a small sieve. I defrosted some frozen plum buttercream, and beat with hand mixer. 16. Brush warmed jam onto the strips of cake to stick the cake together in a checkered pattern. 18. Brush the top of the cake with apricot jam. 19. Place the cake on the marzipan, jam side down. 20. Brush the remaining three sides with jam. 21. Press the marzipan around the cake, making sure the join is either neatly in the one corner, or will be underneath the cake once turned over. 22. Carefully flip the cake over so that the seam is under the cake and score the top of the cake with a knife, you can also crimp the top corners with your fingers to decorate. 23. Neaten the ends of the cake and remove excess marzipan by trimming off a small bit of cake on both ends to reveal the pattern.